There's a method in the madcap magic of this one-of-a-kind creation, an irresistible acquisition from every whimsical angle. 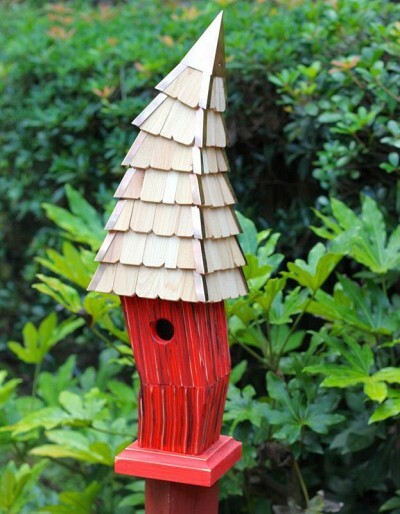 Because behind those angles and the charming design is the rugged Heartwood cypress construction sure to make Birdiwampus your favorite for years to come. A great place for your birds to stay and play, and available in four delightful hues - enough to collect your very own Birdiwampus Village! Your new bird home may be mounted to a 4 x 4 post provided by you. The mounting plate is included. A removeable back disc make for easy seasonal cleaning. Made in the USA! Cellular PVC is completely synthetic and maintenance free wood substitute. It will not absorb moisture, crack, split, warp, delaminate or rot. You have the rich appearance of wood with none of the maintenance issues related to painted wood. It maintains a "like new" appearance in all types of weather. Cellular PVC requires no paint for protection or appearance. It also resists wood-boring insects, freeze/thaw cycles and high humidity.